One of the roles I play in the little software communities I belong to is a bit of an ambassador. I am approachable, easy-going, and tend to flit about between communities. If people feel like they don’t “belong” at a “Agile” event, a “Test” event, or a “DevOps” event, they might know me, and feel a little bit more comfortable. 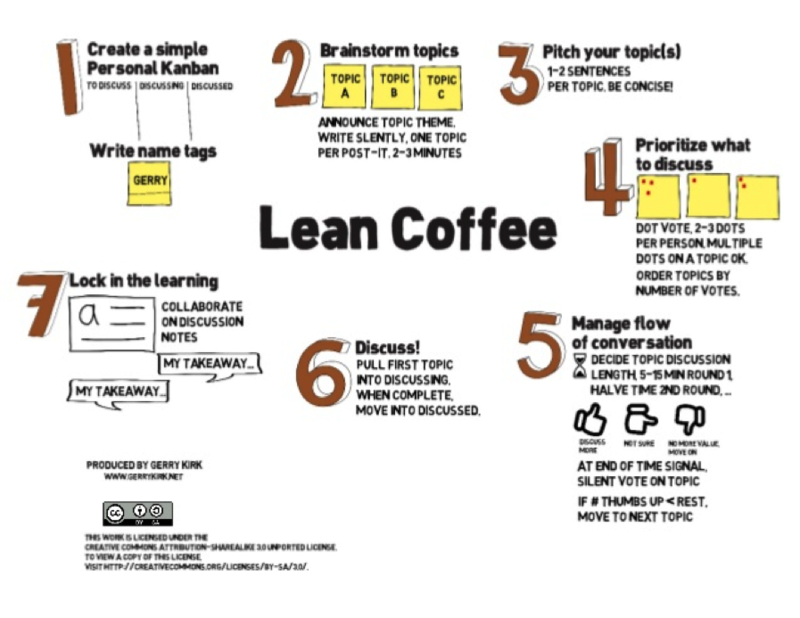 One of the ways I do that is through Lean Coffee. At its heart, lean coffee is a way to put just enough structure around a meeting with no formal agenda. In about an hour, a group of strangers can meet, align on what to talk about, help solve each other’s problems, and leave as … something more than just strangers. 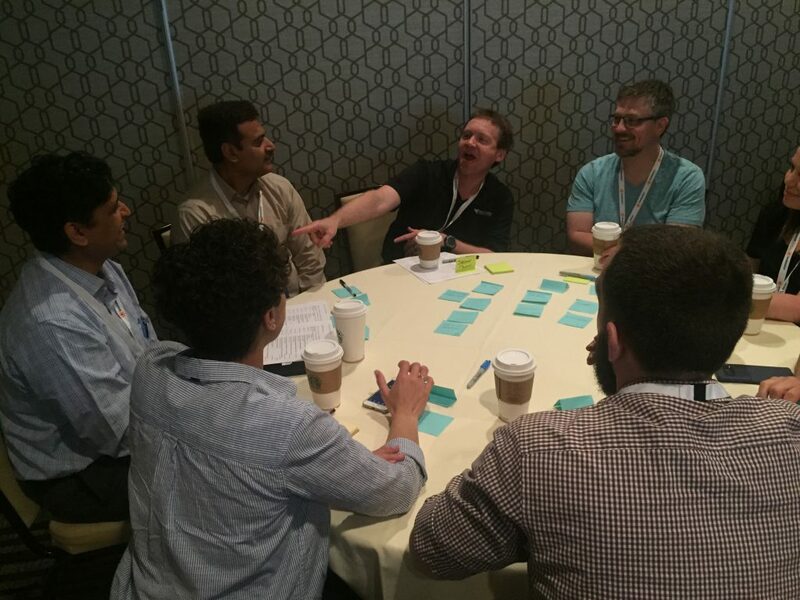 As a conference speaker, it has been my pleasure to run Lean Coffee at over a dozen places over a few years. This morning I again found myself at Agile&Beyond, at 7:30AM. The event asked me to run a pre-conference Lean Coffee Session. Here’s how it went. First we filled the room with round tables, designed to fit 8-10 people. Typically for such an event, I’d fill a table to fourteen, then split. Then it’s time to get started. Attendees build name tags out of stickynotes, introduce themselves, then use stickynotes to build three columns “ToDo”, “Doing”, and “Done.” After creating the columns, attendees brainstorme topics to talk about for five or eight minutes. After the topics comes a “pitch session”, where the authors of the topics explain the topic. Then we vote, with each person “dot” voting two stickies. The facilitator then sorts by the number of votes, and throws the first sticky into the “doing” column. There is a second role in lean coffee — the timekeeper. The timekeeper puts five minutes on a clock, and the group discusses the topic for five minutes. At the end of that five minutes, the timer goes off, and the group takes a quick “roman vote” – thumb up, down, or sideways. Thumbs up suggests more time on the clock, down means the person believes the energy should shift to the next topic, and sideways is undecided. When the time for lean coffee begins to run out, the facilitator completes the last session. After that the facilitator asks the group to discuss at least one “takeaway” each. A takeaway can be something they learned, something they are going to try, a book idea, anything they took away. Personally, I’ve run Lean Coffees as “mixers” before a conference, as “what to do on Monday” toward the end of a conference, as retrospectives, as team-building exercises, and just something to cause the group to talk about what they are most interested in for any group. Today I’d rather talk about why they are so great. Today I ran a lean Coffee Session at Agile&Beyond. Yes, I got to teach a new method to a handful of people, and that made me feel good. What made me feel better was the people. There was Alan, the Project Manager who came back to Lean Coffee at the conference for three years in a row. Mike Clement, who brought me in to the Agile Roots in Salt Lake City and kept in touch. Abby Buell, who I worked with at a customer half a decade ago, and chose to attend my session again today! Jason Tice, who I met at the Agile Technical Conference last year, depicted at right. Even one of my old cadets from Civil Air Patrol, now working in technology, took a seat at a table. In some ways, it felt like old home week. A reunion of sorts. We all knew each other. In a very real way, what matters in my life is not the software. All the software systems we are building, whether or not we made this weeks deadline, it will all fade away. What people will remember, what does matter, is the people in my life I’ve touched, the relationships I’ve built, and how I made people feel. What relationships are you building today? What can you change to make one just a little bit better?